Marie Colvin is a true legend amongst journalists; throughout her career and life, both of which were tragically cut short in 2012 during a fact-finding mission in Homs, Syria, she risked everything to report the cold, harsh facts about life on the warfront, and was determined to find and reveal everything she could no matter what the cost. Her iconic status goes beyond just her eyepatch – she lost sight in her left eye following an attack in Sri Lanka – and even in death her name has become synonymous with war correspondents all across the globe. Her story, or at least the final few years of her life, is now carefully reconstructed by documentary filmmaker Matthew Heineman, who previously scored an Oscar nomination for his film Cartel Land and makes his narrative debut here, in a film that honours the legacy of its central figure as much as it can, complete with a gutsy lead performance by Rosamund Pike who has never been more compelling and downright haunting in a movie. However, the movie isn’t an entirely steady tribute; certain editing choices and a somewhat fractured narrative bring it down just a peg, which occasionally tends to undermine the true power of Marie Colvin’s extraordinary story. The film follows Colvin (Pike) across a period of 11 years, as a journalist for The Sunday Times reporting from the frontlines of conflicts in Sri Lanka, Iraq, Libya and eventually Syria; during most of her excursions, she is accompanied by photographer Paul Conroy (Jamie Dornan) who assists her in telling the stories of war-struck civilians in these harsh conditions. From losing her eye in Sri Lanka to uncovering a mass grave in the desert of Iraq to finding herself right in the crossfires of heavy artillery, it’s little wonder that the movie also shows her to be going through some pretty rough PTSD following her experiences, which end up doing very little to dampen her rather worrying obsession – Dornan’s Conroy even calls it an “addiction” at one point – with risking it all to report from the frontlines, leading up to that fatal excursion to Syria in 2012. It’s an incredibly poignant story being told here, one that’s more relevant now than ever before with journalists being constantly attacked and undermined by certain politicians, not to mention people that dare to call themselves politicians, in an era of “fake news” and “alternative facts” where the truth is so closely kept secret by those in power that they’d rather spread lies than share the facts. Marie Colvin was a reporter who absolutely wanted to report the facts, at a very high cost as it would turn out, and one of the movie’s strengths is in showing her absolute ferocity and determination to pick herself up and do her job, even when faced with such scrutiny in these harsh landscapes where anyone could be killed at any moment. There is a real burning spirit within her that is effortlessly captured via Matthew Heineman’s reasonably steady direction, and especially through Rosamund Pike’s utterly fantastic performance in a role that certainly feels like it wasn’t easy to inhabit yet, appropriately like Colvin herself, she just throws herself right into the thick of it and truly nails the part in a pitch-perfect performance. The film works best whenever it decides to be a tribute to Colvin’s hard legacy, as she was the real deal when it came to war journalism which is a fact that the film does not neglect to show, especially when support for the media is now more vital than ever. However, the film suffers somewhat from the fact that this feels like a documentary filmmaker making their first narrative feature, which isn’t necessarily a slight against Heineman who does fine enough here, but with some aspects of this movie, especially in how it’s edited and structured, you can kind of tell that this was made by someone who’s not used to making a more traditional movie. The editing here tends to be rather choppy and distractingly all over the place, often taking you out of the movie whenever it’s suddenly cutting back and forth to events that you’re not entirely sure are happening in the future or in the present; the film does this a lot, particularly nearer the beginning when you’re only just starting to get a feel for this story and the character you’re following, which may work well for a documentary but not in a film that’s meant have a more solid three-act structure. The structure that it does go with, though, also suffers from a case of repetitiveness; we’ll follow Colvin on an excursion to a foreign war-torn country, then when she’s back in London, and wash, rinse and repeat. There’s not much that’s driving these segments outside of Pike’s commandeering lead performance, because these events feel so similar to one another that it risks becoming dull to watch, which is something you definitely don’t want a film about a slain journalist to be. It makes you wonder, since Heineman is clearly more comfortable working to a documentary structure, why they didn’t just decide to make this a documentary instead of a narrative feature; that way, the editing and structural choices wouldn’t seem so out of place, and you could even dig a little bit further into Colvin’s life and career outside of the limitations that this narrative feature places upon itself. The thing is, if they did make this a documentary, two vital ingredients would be lost; the first would be Rosamund Pike’s completely astonishing portrayal of Marie Colvin, and the second would be a chance to bring Colvin’s story to as wide an audience as possible, especially in a time when journalists are in desperate need of support more than ever. So, I suppose that it makes sense that A Private War ended up being the film that it was, even though it’s sadly far from perfect. 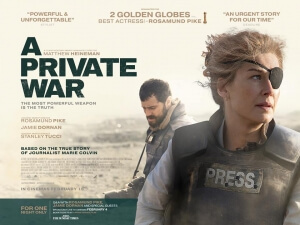 A Private War is a compelling tribute to fallen journalist Marie Colvin, who is brought to life by a career-best performance by Rosamund Pike, but the film tends to suffer from editing and structural choices usually found in a documentary.